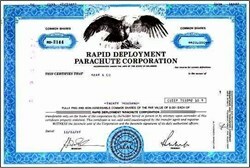 Beautifully engraved certificate from the Rapid Deployment Parachute Corporation issued no later than 1992. This historic document was printed by the Merill Corporation and has an ornate border around it with a vignette of an eagle with its wings spread out perched upon a rock. This item has the printed signatures of the company�s president and secretary and is over 12 years old.